Outdoor celebrations are special events that challenge the host on a number of fronts. A never ending challenge for the outdoor event planner is how to ensure environmental comfort regardless of weather conditions. Although tents provide perfect cover, no one can predict the future weather nor the total heat contributed by participants and supporting equipment. Rental outdoor HVAC units must be stationed to provide cooling and heating as required within the enclosed area. Since most outdoor event planners are now working spring projects, today we’ll focus on outdoor tent cooling services. 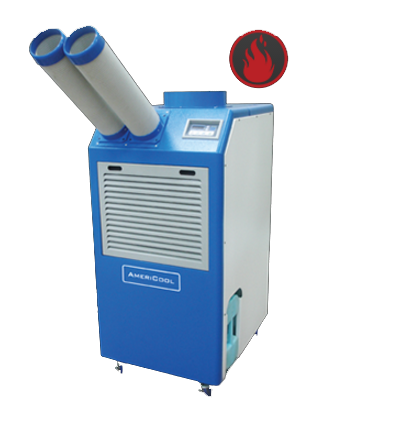 Portable outdoor air-conditioner is the ideal solution for outdoor event cooling. They come in various sizes and capacity to provide sufficient cooling from small to large-scale events. The compressors can be remoted to eliminate HVAC noise from penetrating the event. Our portable rental AC units are heavy duty and regularly maintained. This offers a practical solution for event organizers because this eliminates the need to shoulder the acquisition and maintenance expenses for equipment that is required for a seldom or one-time use need. To find out more about portable rental outdoor air-conditioners, contact Americool LLC. In facilities where precise climate control is crucial, dual purpose portable heat pumps are a ready answer. This smart technical innovation makes transition from winter to spring much smoother especially in critical sites that require precise heat control . This specialized heat pump unit can be set to operate as a heater or an air conditioner. Since you can have both functions in just one compact unit, you can save space and energy as well. Americool's portable heat pumps are engineered to easily calibrate indoor temperature in both commercial and industrial settings. Regulating the temperature settings is just a cinch with its convenient calibration presets. This dual purpose heat pumps are available for a surprisingly affordable rental fee. They likely will more than pay for themselves by slashing energy costs. Investment in technologies that deliver positive return on investment just makes sense. Contact Americool LLC to find out more about dual-purpose heat pump. Heat builds up fast in industrial settings like factories and production lines. The excess heat produced during peak industrial production is not relegated to the summer months. Heat in excess of the production facility’s HVAC system can challenge the construction owner’s staff in February every bit as often as it occurs in August. The irregular nature of industrial climate control is why rental portable air conditioners are required to meet OSHA standards and to prevent overheating and malfunction of equipment. Rental portable air conditioners help maintain a comfortable climate in factory floors. Manufacturing lines usually have large spaces which overwhelm the existing HVAC system. Hot spots tend to form when heat produced by equipment can’t be mitigated by fans alone. When excessive heat can’t be mitigated, equipment and crew alike begin to fail and will cause significant delays in the construction process. Once again, often times these issues of excess heat are temporary in nature and thus temporary portable rental air conditioning systems often are the optimal solution to construction company owners. So if you are a business operator and need short-to-long-term portable cooling solutions, know that Americool is your leading source for affordable rental HVAC solutions. Computers and electronic devices demand environmental control. When your home or business use multiple computers and network devices in a common space it is vitally important to maintain heat and humidity levels within manufacturer’s specification. High quality rental portable air conditioners are increasingly utilized within the home and office space due to deliver upon the shortfalls of your building’s HVAC system. Every facility has a distinct cooling requirement. When an emergency strikes and your HVAC system fails to deliver, fortunately, portable rental air conditioners from Americool are immediately procurable. They come in a broad range of cooling capacities. You can find the perfect unit that can efficiently provide cooling to your application. Aside from that, these cooling units have compact sizes that make it easier to move them across the floor. It can directly provide cooling to spots where heat accumulates fast. Commercial spot coolers applied cutting edge technology so they can powerfully function and provide sufficient cooling in highly critical environment. What is great with Americool's portable air conditioners is that they can be installed and operated without complex set-up. So during emergency cases, you can instantly run them to cool the facility right away. Indeed, portable air conditioners are necessary for controlling indoor temperature, air distribution and humidity level. To find out more about commercial portable air conditioners, contact Americool LLC.